Any computer user needs to know how to protect their information assets and securely connect to another system over a network. Understanding security fundamentals is the ideal starting point for anyone interested in learning computer networking and security basics and is aimed at helping computer users achieve better efficiency in using computing resources. The objective of the workshop is to impart essential knowledge on how to leverage from standard security and networking practices. The knowledge provided is based on real time industry exposure to give a practical understanding of essential security requirements. The participant is exposed to practical aspects of security and networking to give a better understanding of how to secure information, maintain privacy and avail the best of the computing resources available. This workshop ensures that participants apply knowledge of security concepts, tools, and procedures and gain knowledge on how to react to security incidents. Participants understand how to anticipate security risks and guard against them. The objective of the workshop is to create the competency and expertise required in proven security and networking skills thereby adding value to the workplace. Organizations are able to increase productivity in the workplace and reduce learning curves. Formal training ensures individuals have an assured means of demonstrating their expertise and skills in enhancing better security protocols in the workplace. This workshop covers the essential concepts of security and ensures that the candidate has the fundamental knowledge and skills required to work in a secure network enabled environment and is especially useful for those involved in system security, network infrastructure, cryptography, assessments and audits. 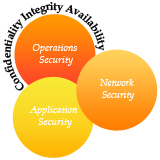 This workshop will significantly benefit anyone who is concerned about the integrity of the network / IT infrastructure. Anyone aspiring for a career in Information Security would benefit from this workshop. The workshop is restricted to participants who have basic computing skills and some knowledge of networking concepts.